Portland’s love for comics likely stems from one of the major comic book houses making Stumptown its secret lair. So secret, in fact, that many residents don’t even know it’s here – Dark Horse Comics set up its Horse-Cave (hmm… maybe a better name is in order) in Milwaukie, of all places. Mike Richardson founded Dark Horse Comics in 1986 as an off-shoot to his comic-book retail chain located in Oregon, Things From Another World, with two titles: Dark Horse Presents and Boris the Bear. Over the years, Dark Horse Comics has produced a variety of alternative titles but also many that are household names such as Buffy the Vampire Slayer, Star Wars, Mass Effect, Aliens, Predator, Conan, Sernenity, and many, many more. Some of its titles like The Mask, Hellboy, and Sin City have seen several movie adaptations make it to the silver screen. With this kind of pedigree, it only makes sense that Portland should have its own comic book conventions (also called “cons” for those of you who didn’t get sucked into the collecting addiction cancer known as comic books). Portland actually used to have two comic cons. The original con was the Stumptown Comics Fest which started in 2004 and overlapped the Rose City Comic Con for a few years before entering an operating agreement with Rose City Comic Con in 2013. The Rose City Comic Con started in 2012, with its second event co-produced, co-funded, and co-organized by Emerald City Comicon, the largest annual Pacific Northwest comic book convention held in Seattle, Washington – Portland’s arch nemesis. What do attendees do at comic cons? Anything you can imagine. Initially, comic cons were huge gathering places where attendees would sift through dusty back issues from comic book stores all over the country who would open vendor booths. You can still pick up your missing issues, however, now, cons are an excuse to dress up as your favorite comic and movie characters for costume play (cosplay) to compete in costume contests, listen to fascinating panel discussions covering a variety of comic book industry topics, meet famous movie stars and celebrities, get autographs, and so much more. In addition, cons have added huge spaces dedicated to gaming of both the board and video varieties. Portland Retro Gaming with pinball and video console games from the days of yore. Rainy Day Games featuring Codenames, Dexterity & Speed Games. Renegade Games like Lanterns, Lotus, and Fox in the Forest. 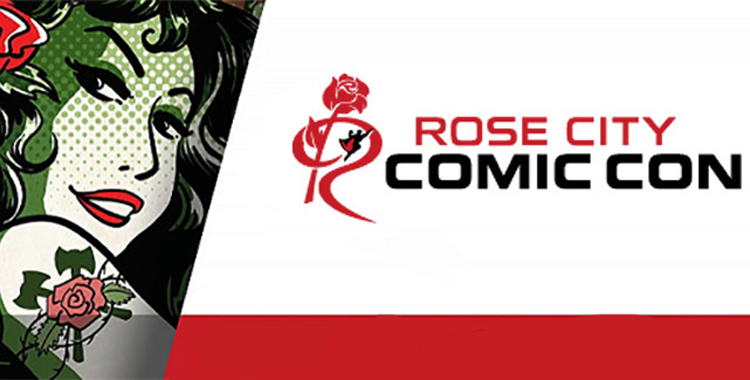 The Rose City Comic Con is held annually in early September with 2017’s running from Friday, September 8 through Sunday, September 10 at the Oregon Convention Center located at 777 NE Martin Luther King Jr Blvd, Portland, OR 97232. Tickets start at $30 (for Friday Only) and range up to $350 for a variety of different VIP passes. You can buy tickets online and find out more at Rose City Comic Con’s website. What are your favorite comic book stories and how did you get your interest in comics? Pen your origin in the comments!